Born in Oklahoma and raised in N.E. Pennsylvania, Joe made the trek all the way down to South Carolina, accompanied by his cat Loki, of course, to join us here at Laudisi. 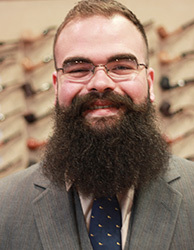 A pipe smoker of many years, his knowledge of pipes and tobacco, together with his real-time experience in shipping and distribution, makes him a perfect fit for our team. When he's not traveling the West Coast building strong partnerships and providing retail solutions for brick and mortar stores, you'll usually find Joe listening to jazz, reading scifi, or painting. As an oil painter himself, he has really come to appreciate the work of Menzel, Turner, and Bargue, as well as more recognizable names like Caravaggio and Rembrant. In fact, during college he even studied under a few different artists in their personal studios. If you can't find him doing any of those things, however, he's likely outdoors, hiking, or camping in some remote place, or simply resting in his hammock (he doesn't like beds). Now that he's home at Laudisi, he fully intends to grow his beard back down to his collarbone — where it belongs.